Referrals are not only one of the best ways to get a new customer opportunity, it also lets us know that we are doing a good job. 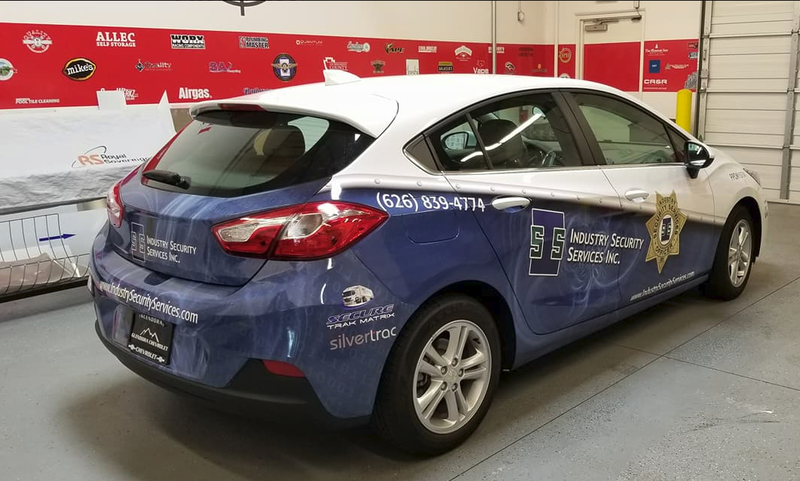 This was the case when we received an opportunity to provide a partial vehicle fleet wrap for Industry Security Services, serving the City of Industry & surrounding areas. Vehicle vinyl fleet wraps can be crafted for fleet vehicles of all shapes, sizes and types. Whether you are wrapping a a fleet of trailers, cars or vans; vinyl vehicle fleet wraps are a fantastic choice for businesses in Riverside, CA.. Creativity combined with versatility are two of the main components that help make vehicle fleet wraps an affordable option, depending on the color of the vehicle; partial vehicle fleet wraps can provide the same high invisibility that you’re looking for; at fraction of the price. 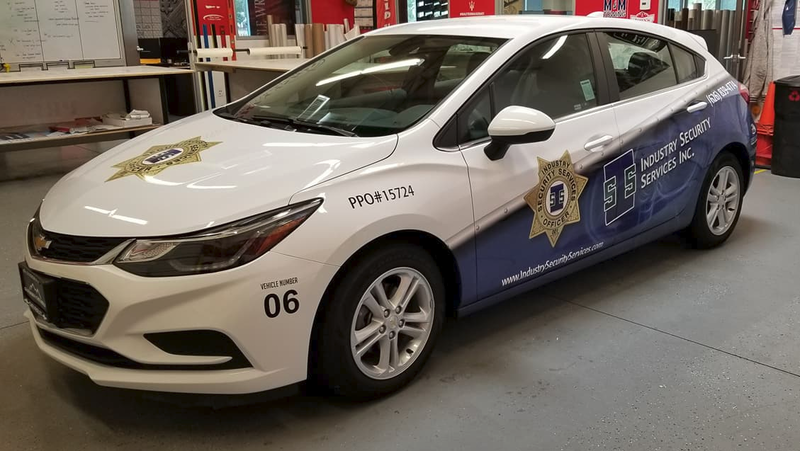 Recently the Industry Security Services, serving the City of Industry & surrounding areas chose Precision Signs & Graphics for their partial vehicle wrap for their fleet of vehicles; let’s look at some of the steps that brought about this affordable partial wrap project. When Industry Security Services, serving the City of Industry & surrounding areas, was considering branding their fleet vehicles they looked for options that would give them the best “bang for their buck”. With their particular branded color set and website already incorporating the same color as their fleet vehicles, a partial vehicle fleet wrap could provide them the same visual effect; and save money too! When looking for a company to design, create and install their partial wrap for their fleet vehicles they chose Precision Signs & Graphics. They considered carefully the craftsmanship, quality of vinyl wrap materials that Precision has come to be known for in the Riverside, CA. area. As this partial wrap project was to be a branding point for their company, it was important that the quality of the partial wrap reflected the quality reputation that they have earned within the community as well. With Industry Security Services constantly being on the road traveling to businesses and construction job sites; their fleet can easily be seen by hundreds or thousands of people in the City of Industry area every day. With a partial vehicle fleet wrap being one of the first impressions that customers will see (whether it be in Riverside, the City of Industry or elsewhere) close attention must be paid during the initial consultation and design. By providing examples, we were able to identify the fonts, colors, graphics and sizing needed to create the partial vehicle fleet wrap to Industry Security Services. Utilizing some additional resources such as their print media and website we crafted a design that accentuated the branded look that followed along with their creative marketing. 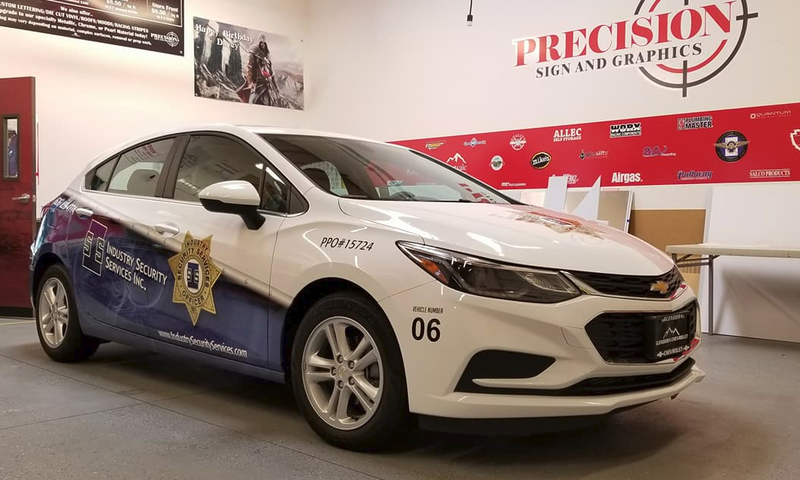 It goes without saying that the final partial vehicle fleet wrap design was approved by Industry Security Services prior to material selection and installation. They were also able to see a full color rendering of what the finished product was to look like before the installation began. Based upon the overall partial vehicle fleet wrap specifications identified in the design we look for the proper 3M or Avery materials that will best suit the application. Materials were carefully hand selected based on the long term mindset we seek to fulfill with our quality partial vehicle fleet wraps. 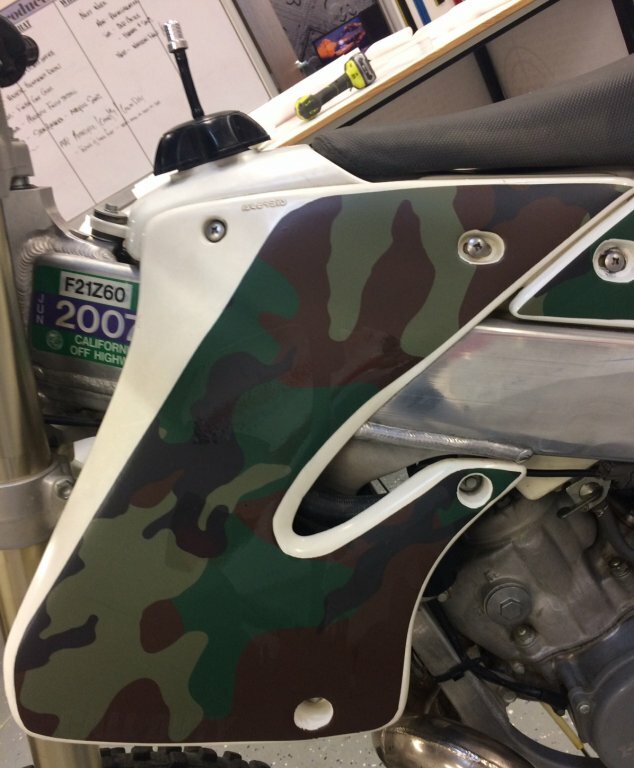 Some vinyl films allow digital and screen printed graphics to be applied where deep contours and corrugations are found (typical on van models with recessed areas and performance cars that have a lot of flair). Other types of films are selected because the application needs, for example whether the application will be for a short or long-term needs. These removable ﬁlms are great for ﬂeet and vehicle graphics; its versatility also works well with interior and exterior signs. 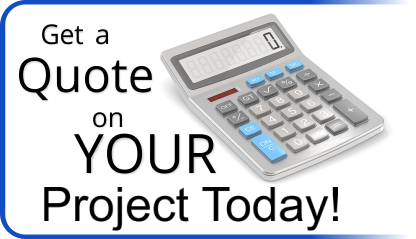 As part of the process for a partial vehicle fleet wrap installation, the installation crew will receive a design template (printout) that identifies the location points for the most important elements in the design, namely the largest photograph or design element and any logos, phone numbers, websites or slogans. Materials are preprinted, cut, labeled (numbered) in the sequence of installation. These pieces are positioned in place while making sure to align these elements first, allowing any additional graphic elements to freely flow around the vehicle shape and complex curves. Because on many partial vehicle fleet wrap installations the design attempts to avoid curved areas, the installation can be pretty straightforward. Next the material is stretched as needed for the shape (much like you would see when you’re stretching plastic wrap over the top of a glass bowl in your kitchen). Only this material is made to be long-lasting in the sun, super durable in the rain and able to be washed over and over again for years to come. 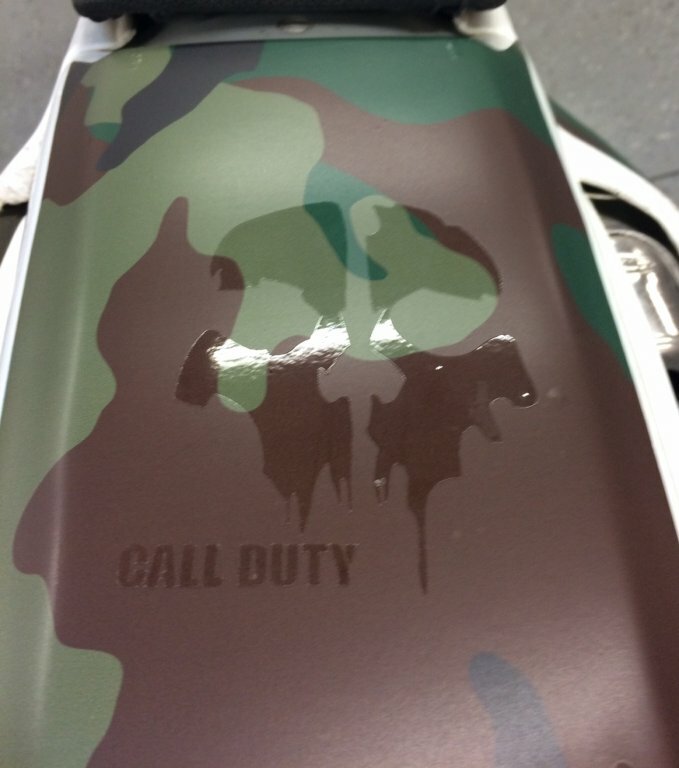 Even for a partial vehicle wrap this process can be a little tricky. For large logo sections you still have to deal with rivets, curvatures in the body of the vehicle, door handles, glass with moldings, etc. this is where experience really pays off. One of the challenges that businesses in Riverside, CA face is trying to find creative ways to let customers know where they are and what they do. Often times businesses will look at a variety of different options such as websites, newspaper ads, flyers, commercials and more; but neglect to look at the unused real estate that is right in front of them. 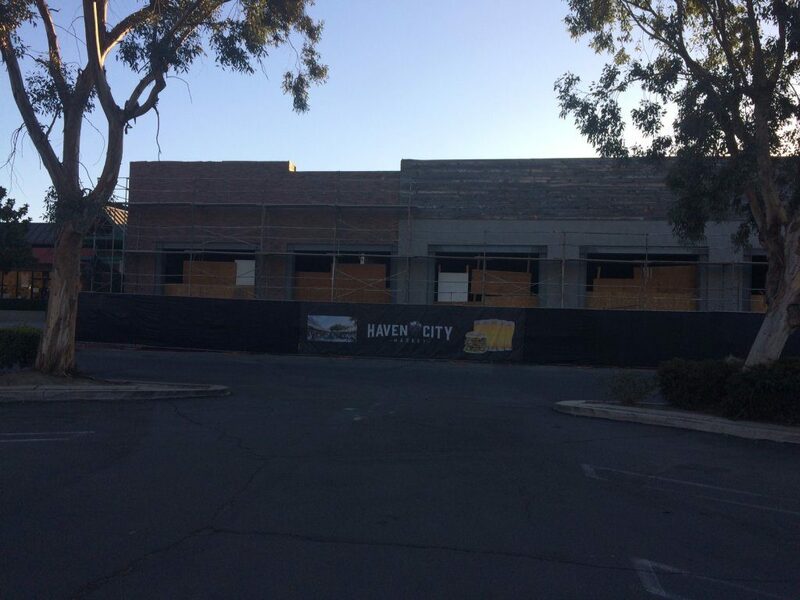 Recently Right There Repair in Riverside, CA chose to take advantage of the real estate they had on the front of their store. There were many options available to them to make sure the storefront graphics looked great and would attract attention to their business. Let’s look at some options and info that helped them choose their storefront window graphics. 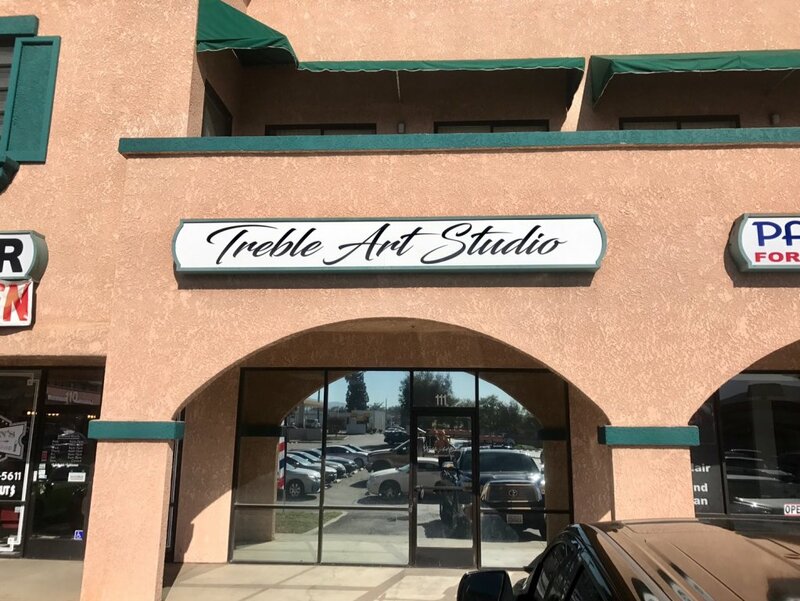 When looking at the size and location for the storefront window graphics, Right There Repair in Riverside, CA, looked at many different choices provided by Precision Sign and Graphics that would suit their budget and needs. Single color diecut window graphic stickers would allow a traditional, single color labeling for words and simple logos to be placed onto the Windows. Full color diecut window graphics can accomplish the same as single color but with a little more flair, especially if the storefront window is tinted; allowing for more color options. Full color, full coverage window graphics allows you to use every square inch of your windows to be wrapped just like you would a car allowing for expressive graphics that can really get your customers attention; but can be busy depending on the size of the storefront window and the graphic used. 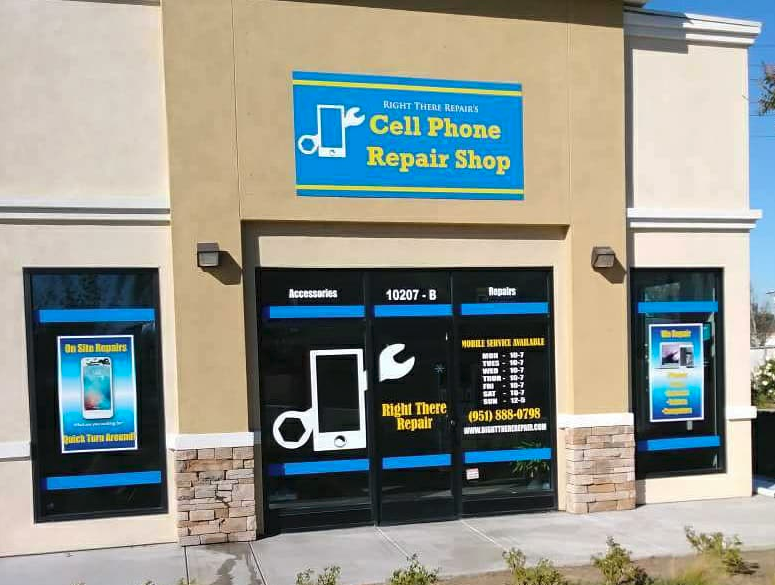 So to understand better the choice Right There Repair in Riverside, CA made for their storefront window graphics let’s look at the advantages for each. Single color diecut window graphics, traditionally done in white, is a great and affordable way to help put information on the front of your business. Text and simple shapes are best to be used with this type of window lettering. Made from a high grade, weather resistant, vinyl window lettering for the front of your business in Riverside, CA; these Single Color Diecut Window Graphics can easily last five years or more. 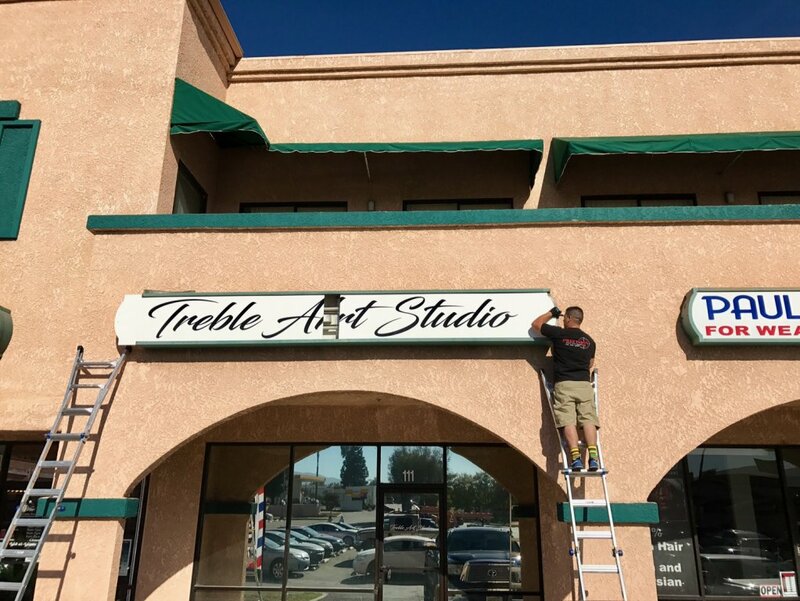 Those Riverside, CA businesses that have an overhang where the diecut window graphics are not in direct sunlight, the vinyl used by Precision Sign and Graphics can last even longer. You would care for windows treated with diecut window graphics with a soapy solution just as you would treat the glass. Reverse diecut window graphics can be used as well putting the graphics on the inside of the window. While diecut window graphics take a little bit more labor it does traditionally work out to be less expensive than full coverage window graphics. Along the same lines as single color, full color diecut window graphics can be created to give your Riverside, CA. window application that extra pizzazz. Whether a combination of colors or a full color print, we can diecut shapes to provide a greater variety of visual options. Uses for full color diecut window graphics could be: multi-colored logos, a lettering or graphic that would have a printed pattern or bursts of colors that would draw more attention. Because full color has a tendency to fade we treat all of our full color diecut window graphics with UV coating to help increase the life of the storefront window graphics. Growing in popularity in the Riverside, CA. area is the use of full color, full coverage storefront window graphics. By utilizing full color, full coverage window graphics it opens up the pallet of possibilities for colors and design choices to really make the front of your business stand out. There are multiple types of full color, full coverage storefront window graphics vinyl that are used, depending on the application. All of the full color, full coverage window graphics installed by Precision Sign and Graphics in Riverside, CA utilize UV coating for protection and reduction of color fading. In addition, you can also choose to have a full color, full coverage storefront window graphics that are translucent, (like a tent). Utilizing full color, full coverage storefront window graphics for 100% coverage of your windows, or sections of storefront windows, allows for full expression and impact of your message, slogans, pictures and information to be easily read at a distance. Plus with attention grabbing colors it can really help set your business apart from your competitors. Window graphics are a great way to help put out some of the most important information about your business and/or put attention grabbing graphics; right on the front of your business using the existing window space that you have. Whether you have a business in a strip mall or standalone establishment, chances are much of your building is wrapped in windows that can be utilized as billboard space help get your message out. Trust your LOCAL Storefront Window Graphic Expert. Precision Sign and Graphics serving Riverside, CA, has made the investment to have available the equipment and skill to provide our customers with the best quality of materials and craftsmanship. Starting with our graphic design department; we will work with you to provide you with a graphics impression of what your project will look like. Then, utilizing the best quality materials for the application, we will go to work transforming your company, corporate or fleet vehicle into that attention grabbing, billboard on wheels you are looking for. Well designed and placed mural wallpaper can provide a great first impression. Printed wallpaper can set the mood or tone of the conversation, make someone feel at ease or even confident that they’re in the right place. Custom Printed Wallpaper can help in this effort. Custom printed wallpaper can be designed, printed and installed by Precision Sign and Graphics serving Riverside, CA. on commercial grade vinyl making a durable and long-lasting statement for your business or organization. 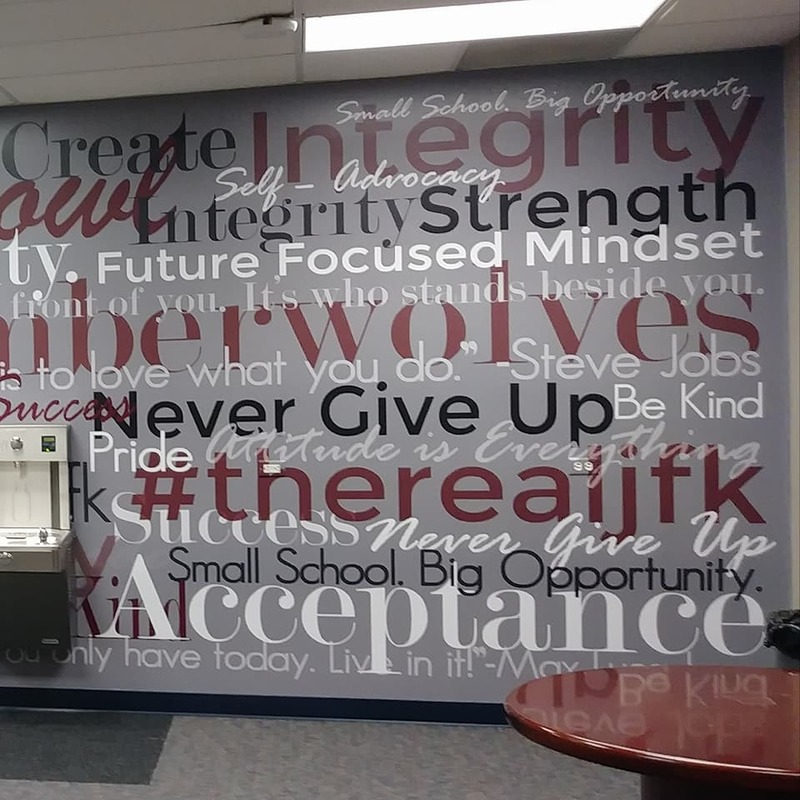 Recently John F Kennedy Middle College High School in Norco CA chose to utilize custom printed wallpaper, but not to get the attention of a customer; but rather to provide an inspirational message to the students and visitors to their school. Let’s look at some of the steps that brought about this affordable custom vinyl wallpaper project. When John F Kennedy Middle College High School in Norco CA was looking for a way to send a positive message to students and parents they considered a variety of things, cost being one of them. The “real estate” that was available was a large open wall that might hold some pictures or better yet a custom printed wallpaper that really sets the tone of a conversation. When putting together a printed wallpaper design we look at many different factors such as: placement of the mural, the lighting in the room, foot traffic (durability), is it just an image or an image with a message. 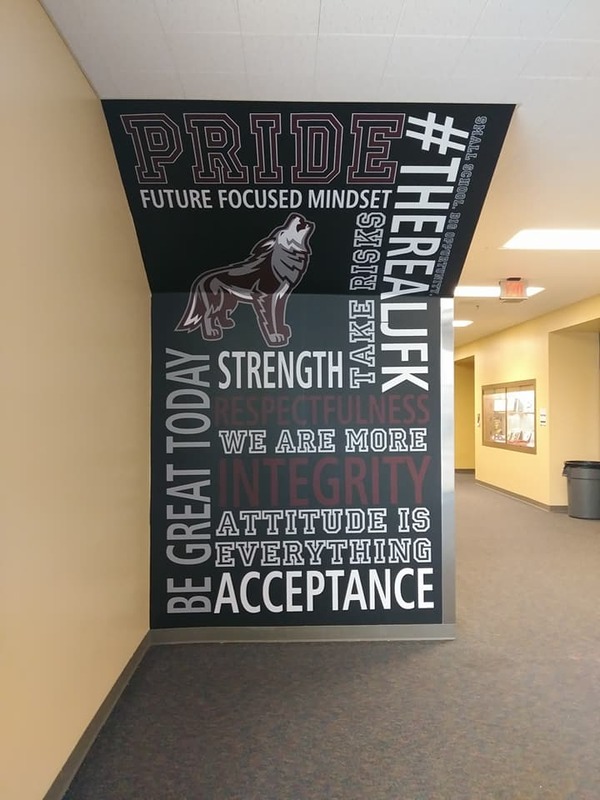 By providing examples to the John F Kennedy Middle College High School representative, we were able to identify the images, message, graphics, colors and sizing needed to create the printed wallpaper to John F Kennedy Middle College High School specifications. Another consideration for a print job of this size is the use of high resolution, licensed images. You can’t take a small image, downloaded from Google and print it on a wall without it being distorted. PLUS a professional, reputable sign company will always use quality, high resolution images that have been properly licensed for commercial use. Naturally the final printed wallpaper design was approved by John F Kennedy Middle College High School prior to material selection and installation. They were also able to see a full color rendering of what the finished product was to look like before the installation began. The custom printed wallpaper used by Precision Sign and Graphics serving Riverside, CA. is made from a thick, commercial grade 5 yr. 3M vinyl, laminated with 3M 8520 matte laminate that utilizes cured ink. This helps ensure the durability of the material, even in high-traffic and sunlight conditions. As part of the process for a Custom Printed Wallpaper installation, the installation crew will receive a design template (printout). Materials are preprinted on our HP3 Latex 360 large-format printer, cut, labeled (numbered) in the sequence of installation. When dealing with a large area for the printed wallpaper, this is where our installation crew really shines. Many walls have seems, doors, thermostat controls, light switches and other protrusions that will need to be professionally handled in order for the final product to look perfect. This install included a measurement for the water fountain as well as working with trim on the angled wall. 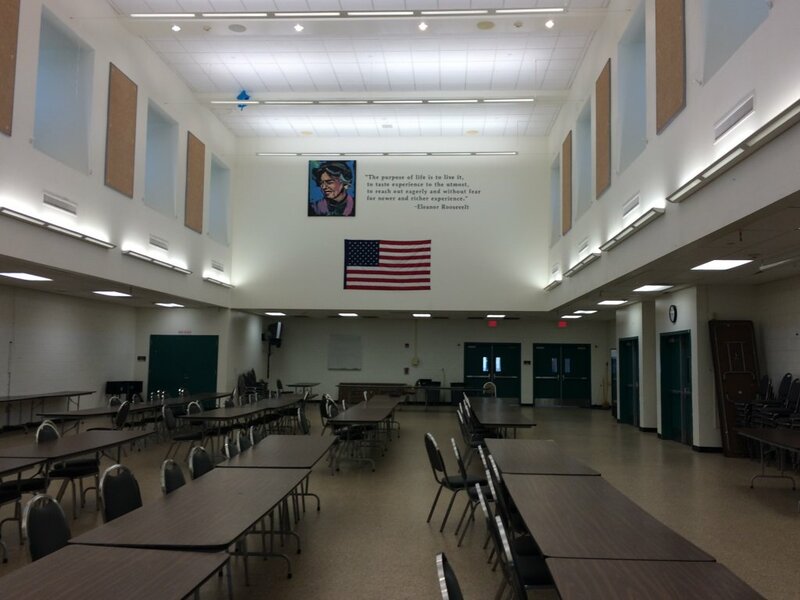 Overall the John F Kennedy Middle College High School in Norco was very satisfied featuring the printed wallpaper and the positive message it brings to the students, faculty and parents. Precision Sign and Graphics is a locally owned and operated sign company that utilizes the latest technology, top industry graphic design talent and state-of-the-art equipment and materials to produce our the very best product available in the Riverside, CA. area (or anywhere else for that matter). We seek to build long-term relationships with our customers by treating every customer with respect, understanding the diversity of opinions and a partnering mindset desiring to see your business succeed. Call to let us quote your custom printed wallpaper today! Sometimes as a business owner I have to take a few moments to reflect on the friends, colleagues and customers that the good Lord has placed in my path. Being successful in business should, at times, give us the encouragement and confidence to do the little extra; not as a mindset of profit but rather an appreciation for who and where we are in life. This was the opportunity that came when a good friend that owns West Coast Collision brought a vinyl wrap project to us here at Precision Sign and Graphics. The task: Replace the number three with a number seven. The opportunity: To make a young man’s birthday something very special. The owner, and good friend of mine, from West Coast Collision has helped me out of a bind more times than I could’ve imagined. 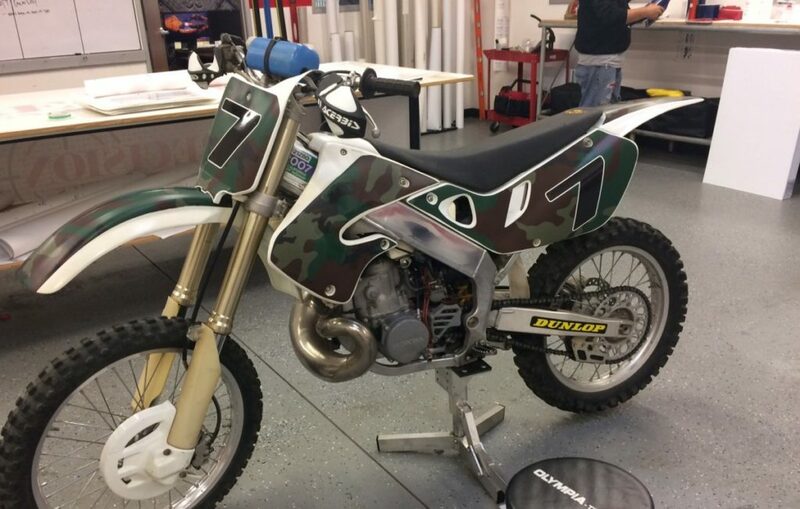 The other day he brought me a plain white dirtbike and ask if we could simply change the number three to a number seven. He explained that his secretary had purchased the motorcycle for her son as a birthday gift, something he is always wanted but she could never afford. After hearing this story we ask Mark, the owner of West Coast Collision, if we could do a little something more. 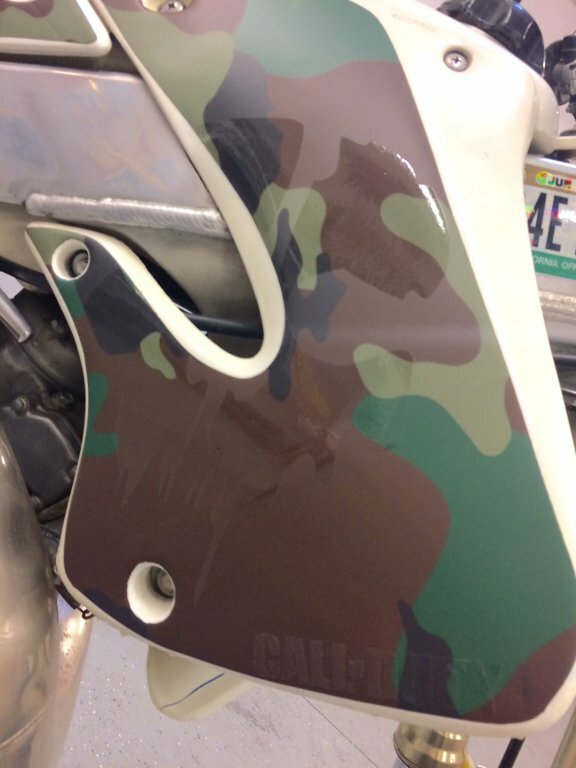 With a little chat we found out that his secretary’s son was very much into camo and the Call of Duty, we use that to put a Precision Sign and Graphics special touch on the project. 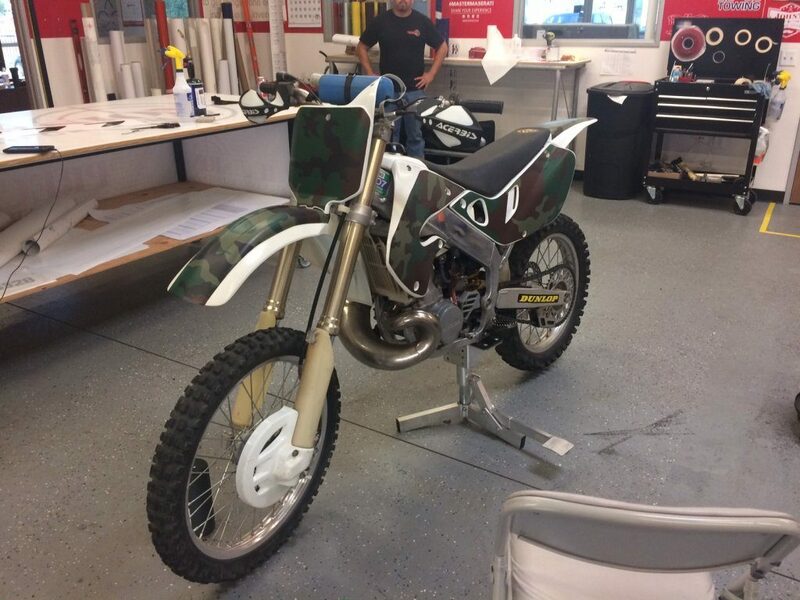 with the multiple segments and shapes of the motorcycle careful attention needed to be paid during the design so that installation would be a simple, step-by-step process. We chose the font, art and color schemes from our approved Sign elements art library website as to ensure a consistent and recognizable level of art. 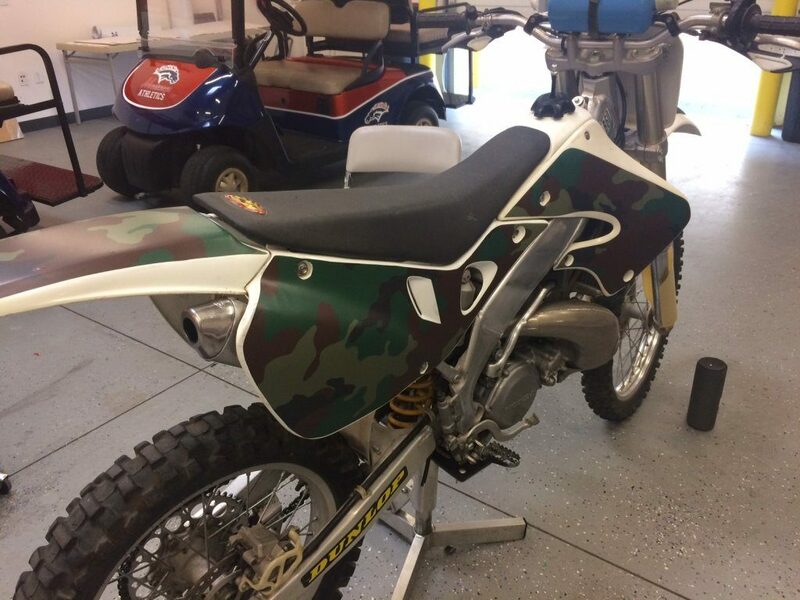 Based upon the overall wrap specifications identified in the design we chose Ij180CV3 with 8520 matte laminate that best suited the application; materials were carefully hand selected based on the need of durability for an off-road motorcycle. The vinyl wrap project was printed on our HP Latex 360 wide format printer. As part of a perfect installation, the installation crew will receive a design template (printout) that identifies the location points for the most important elements in the design, namely the largest photograph or design element with the logo. These elements are positioned in place with the installation crew making sure to align these elements first, allowing any additional graphic elements to freely flow around the shape and complex curves. 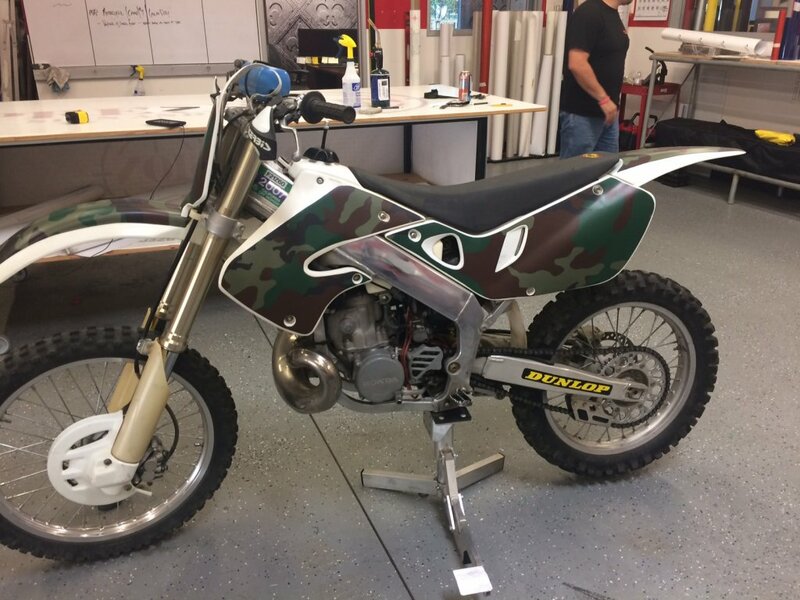 We used knifeless tape to work the vinyl and form the cutlines needed for this final wrap as the motorcycle utilized multiple shapes and surfaces. 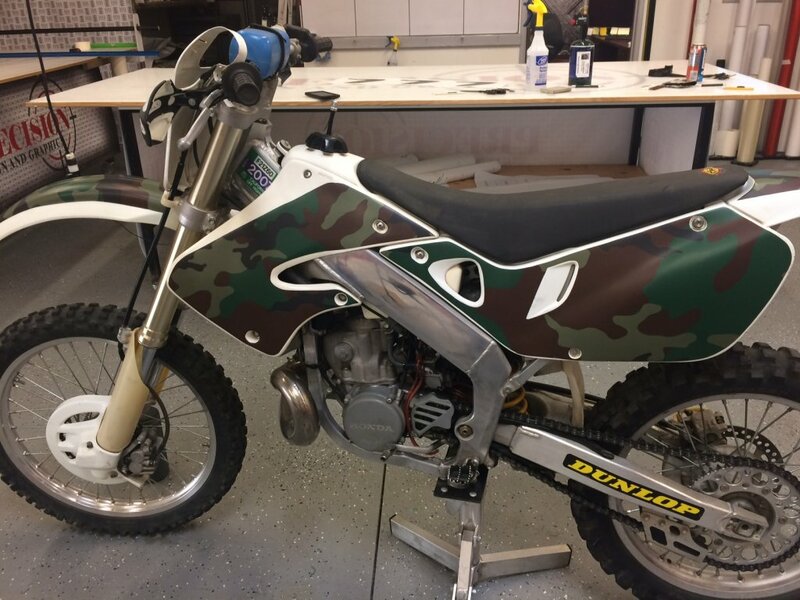 The end results was a very pleased and happy recipient of this unique motorcycle wrap. It is our hopes that the birthday boy enjoys his birthday present for many years to come. First impressions don’t always have to equate to a dollar figure. Sometimes first impression can set the mood or tone of the conversation, make someone feel at ease or even confident that they’re in the right place. Custom Printed Wallpaper can help in this effort. Custom printed wallpaper can be designed, printed and installed by Precision Sign and Graphics serving Riverside, CA. on commercial grade vinyl making a durable and long-lasting statement for your business. 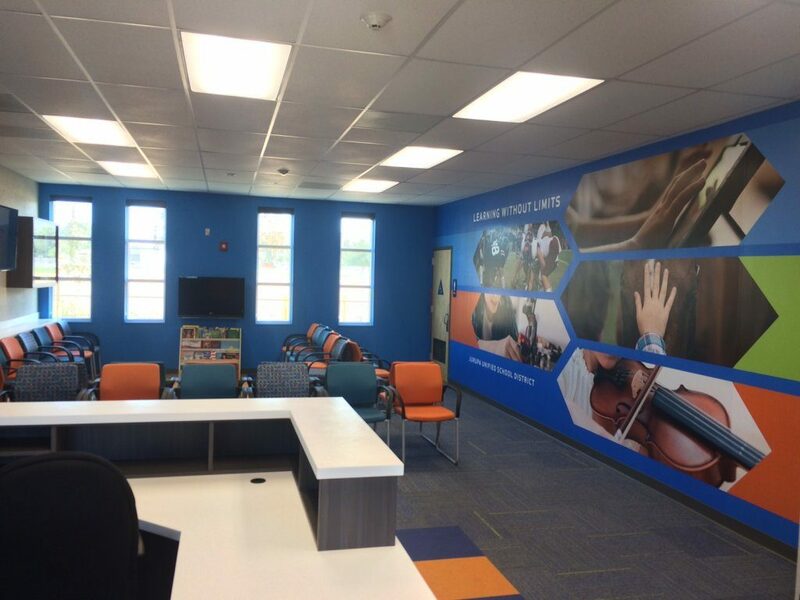 Recently Jurupa Unified School District Parent Center chose to utilize custom printed wallpaper, but not to get the attention of a customer; but rather to provide a solid first impression for parents. Let’s look at some of the steps that brought about this affordable custom vinyl wallpaper project. When Jurupa Unified School District Parent Center was looking for a way to make parents feel confident about their school their children were to be attending they considered a variety of things, cost being one of them. The “real estate” that was available was a large open wall that might hold some pictures or better yet a custom printed wallpaper that really sets the tone of a conversation. 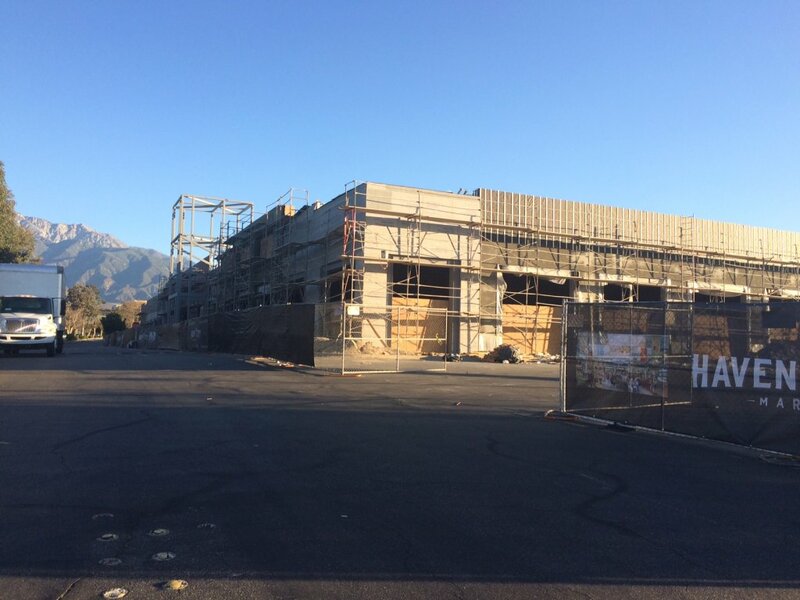 The Jurupa Unified School District Parent Center is part of the Jurupa Valley Unified School District responsible to oversee the 25 area schools and educate roughly 20,500 students. This parent Center is just one step of the many positive things that the school district is doing to help bridge the gap between the school, the student and the parent partnering in the child’s education. When putting together a printed wallpaper design we look at many different factors such as: placement of the mural, the lighting in the room, foot traffic (durability), is it just an image or an image with a message. 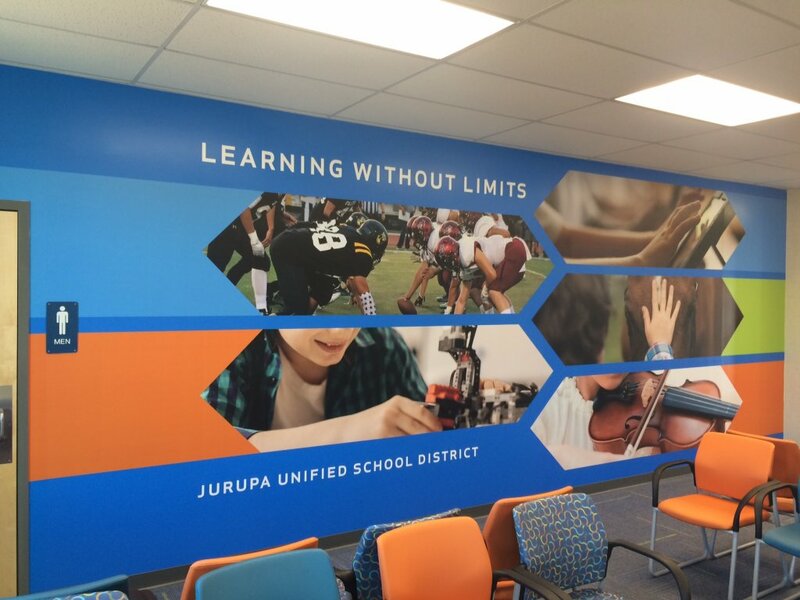 By providing examples to the Jurupa Unified School District Parent Center representative, we were able to identify the images, graphics and sizing needed to create the printed wallpaper to Jurupa Unified School District Parent Center’s specifications. 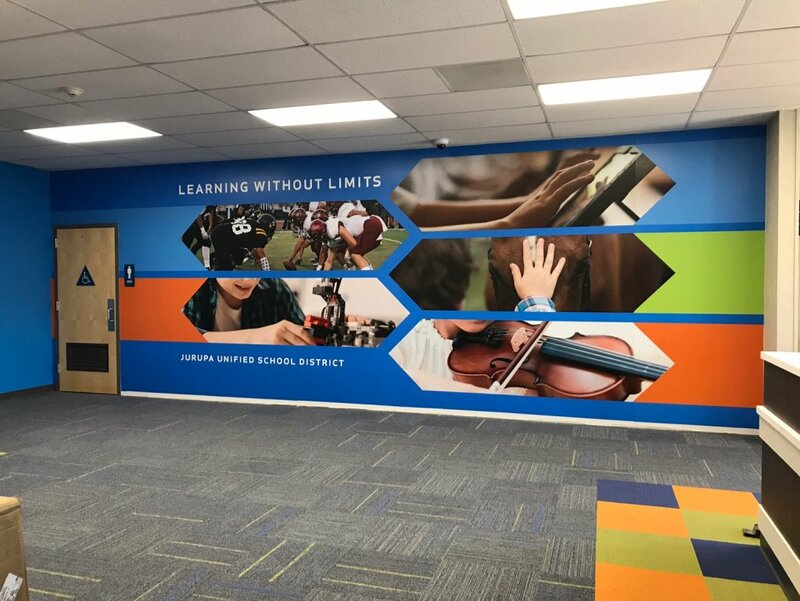 Naturally the final printed wallpaper design was approved by Jurupa Unified School District Parent Center prior to material selection and installation. They were also able to see a full color rendering of what the finished product was to look like before the installation began. Many walls have seems, doors, thermostat controls, light switches and other protrusions that will need to be professionally handled in order for the final product to look perfect. The complete build took approximately two weeks from inception to installation. 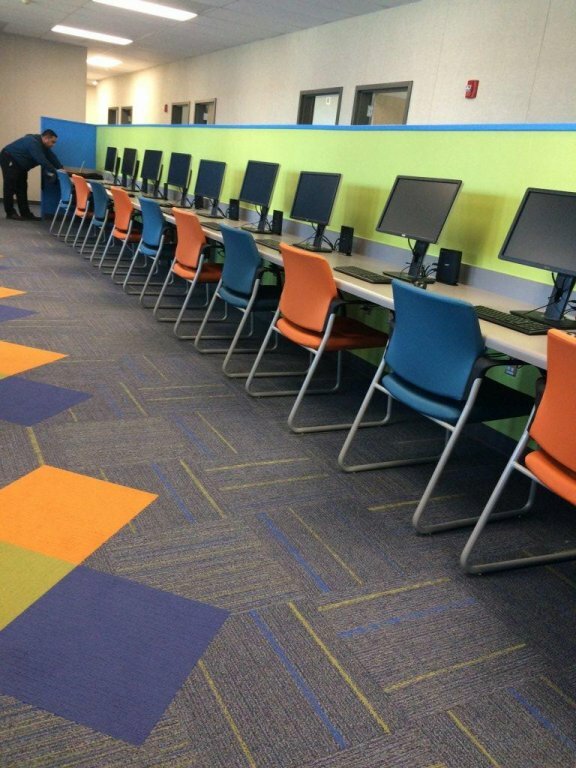 Overall the school district was very satisfied featuring the printed wallpaper for their grand opening of the “new Parent center”. For this customer spotlight it’s not as much about what we’ve done, as what the possibilities are. 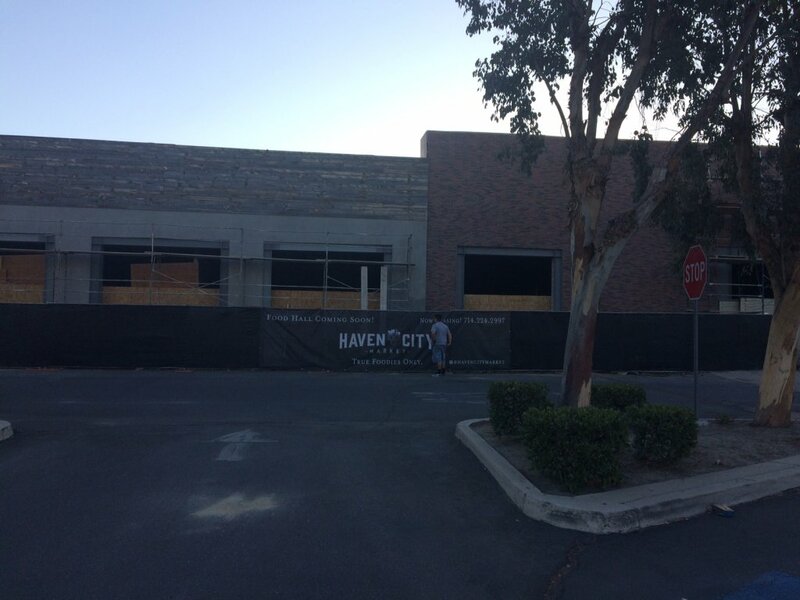 The Haven City Market is in the process of converting an old JC Penny shopping store in Rancho Cucamonga into an eclectic, new age food court. This type of forward thinking really gets us, at Precision Sign and Graphics, excited because this type of business can restore a building, a Plaza and a community. 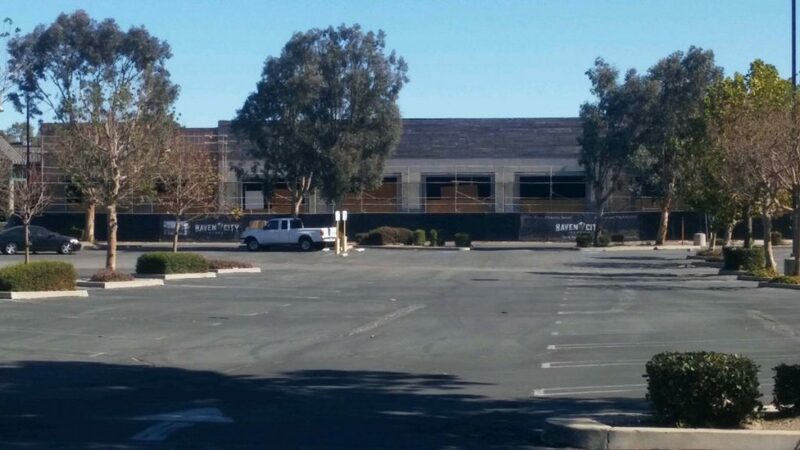 When a group of investors from Orange County California were looking to convert an old JC Penny shopping store they knew that signage was going to be important. Part of a good marketing plan is to let the community around you know about a developing project to help build brand recognition and excitement around What is coming soon. With this eclectic, new age food court these investors look to create a venue of high end cuisine establishments that will offer a variety of food concepts; all wrapped into a mall like setting. 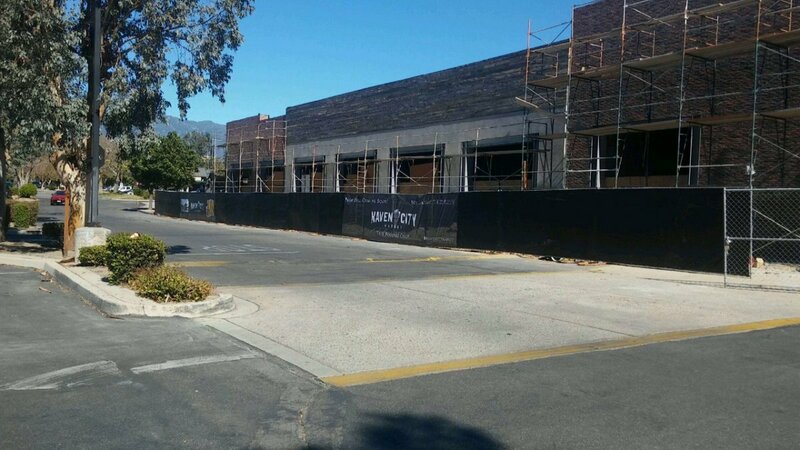 With an indoor park combined with many choices of food and drink establishments this is sure to become a central hub for the growing demographic seen in the Rancho Cucamonga area. 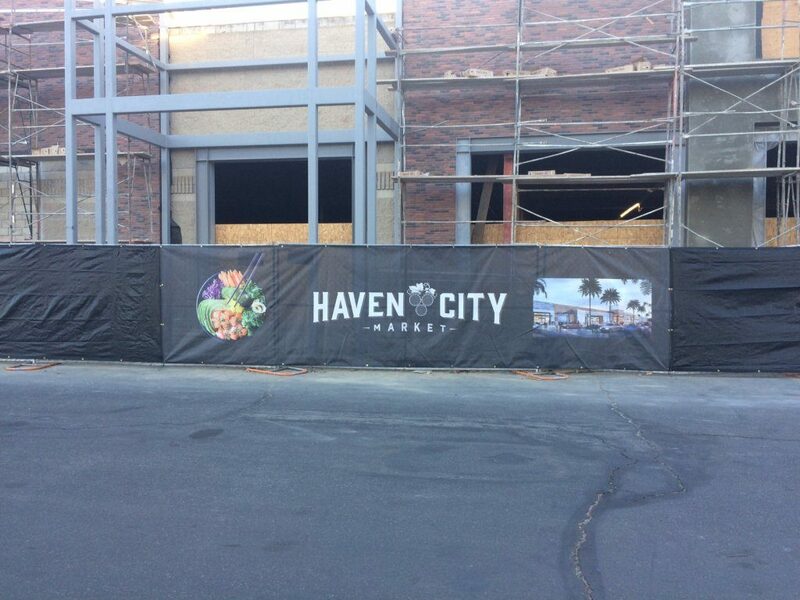 Precision Sign and Graphics , a Signworld Affiliate, installed over 300 feet of black mesh construction fence and six (6) 24′ custom printed fence banners to help them advertise for the Haven City Market located at 8443 Haven Ave Rancho Cucamonga, Ca and the long build ahead. 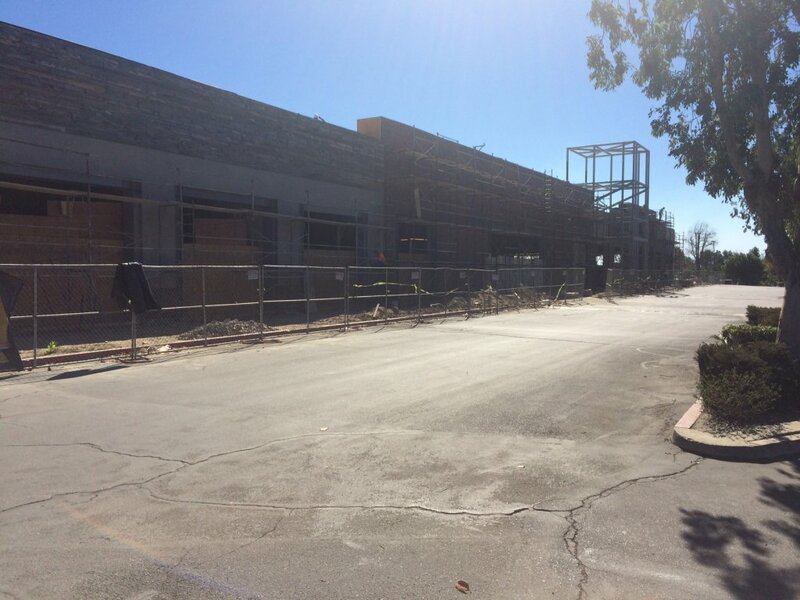 By the time this eclectic, new age food court center opens in early spring, all the local residents and traffic that frequent the area will be well informed of the new trendy center in Rancho Cucamonga. With the number of different vendors and special vendor pricing, Precision Sign and Graphics , a Signworld Affiliate, we can offer almost any type of marketing signage for your business or business project. Sometimes landing a vehicle graphics project is just a matter of being in the right place at the right time; other times it is because you were hand selected because of your workmanship reputation; the latter was the case when we received a call from the “Transcend Creative Group” out of Deerborn Michigan. 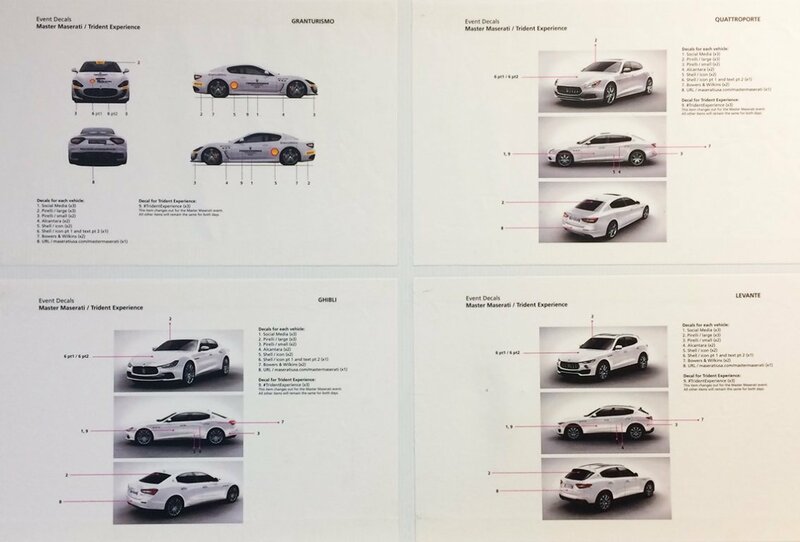 Excited to be selected for this vehicle graphics project, we were contracted to produce and install a package of vehicle graphics for their advertising partner Maserati; let’s look at some of the steps that brought about this exciting project. 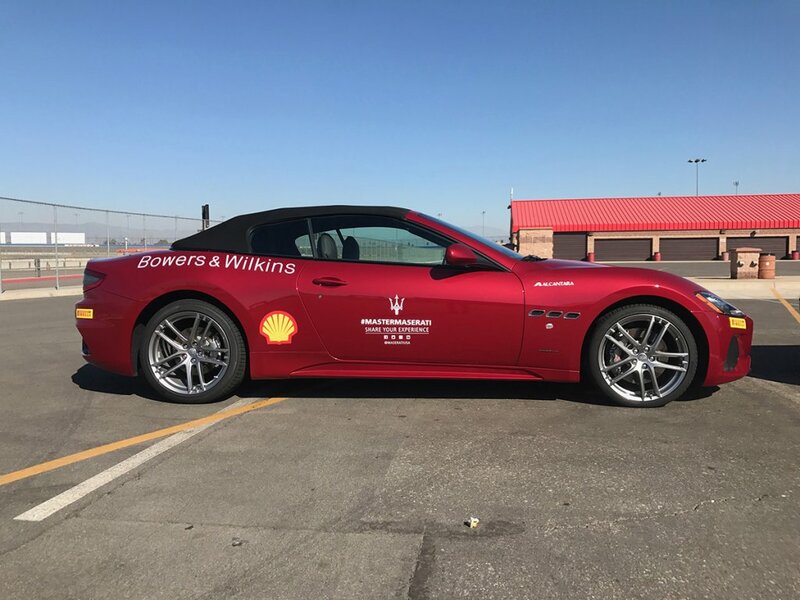 What brought about the need and the call from the Transcend Creative Group was because they had a need for vehicle graphic kits to be printed and installed on 11 brand-new Maserati’s that were participating in the Master Maserati event at the Auto Club Speedway in Fontana California. The Transcend Creative Group is partnered with Maserati North America, providing support within several initiatives. From brand awareness with consumer ride and drives to brand and product training with Maserati dealerships across the country, they have helped Maserati craft and deliver exceptional training and consumer experiences. When looking for a company to print and install their partial graphics for a fleet of 11 Maserati’s they chose Precision Sign & Graphics. They considered carefully the craftsmanship, quality of vinyl graphics materials that Precision has come to be known for in the Riverside, CA. area. As this partial graphics project was to be a branding point for their company and their relationship with Maserati, it was important that the quality of the partial graphics reflected the quality reputation that they have earned nationwide. While Precision Sign and Graphics has the full capability to utilize the talents of their in-house graphic design team, the designs for the approximately 19 different graphics were provided by the Transcend Creative Group. The vehicle graphics, supplied by the Transcend Creative Group, were a combination of print and cut vinyl decals, along with cut/masked decals. Based upon the overall partial vehicle graphics specifications identified by the Transcend Creative Group we chose to utilize the high quality materials featured from 3M and Oracal. These quality vinyl materials allowed us to provide the look that the Transcend Creative Group was going for based upon their design and branding relationship with Maserati. As part of the process for a partial vehicle graphics installation, the installation crew will receive a design template (printout) that identifies the location points for the most important elements in the design, namely the largest photograph or design element and any logos, phone numbers, websites or slogans. Materials are preprinted, cut, labeled (numbered) in the sequence of installation. These pieces are positioned in place while making sure to align these elements first, allowing any additional graphic elements to freely flow around the vehicle shape and complex curves. Because on many partial vehicle graphics installations the design attempts to avoid curved areas, the installation can be pretty straightforward. The day the installation started out with the 11 brand-new Maserati’s being unloaded from three orange semitruck’s. Next the 11 Maserati’s were immaculately detailed and presented to Precision Sign and Graphics to install the print and graphics packs for each. 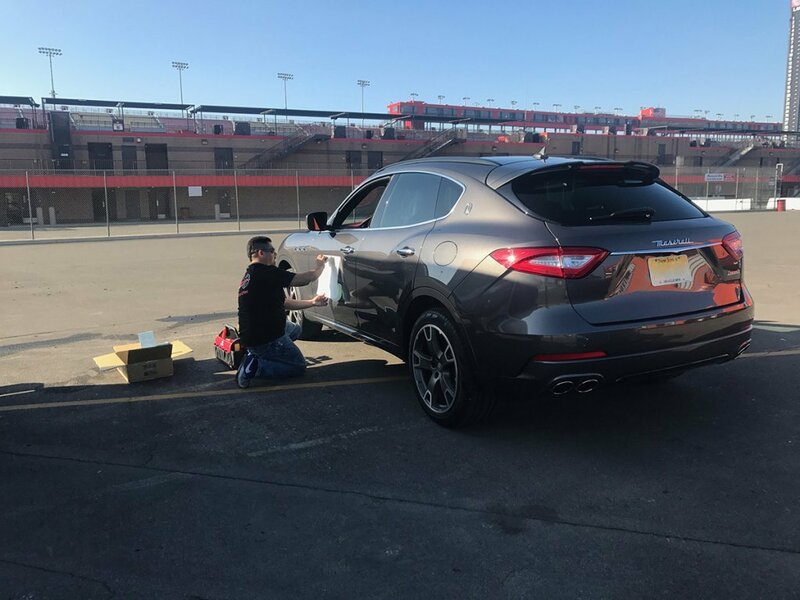 Our professional crew of 3 installers took approximately 7 hours to apply approximately 19 different graphics to each of the 11 Maserati’s on-site. Because of the nature of these elegant Maserati’s being so well handled by our installers, we naturally drew a crowd. As many watched our “Precision Pit Crew” at the Auto Club Speedway in Fontana California we caught the attention of additional professional organizations associated with NASCAR. These professionals were Detail 2 U, an authorized dealer for NASCAR and Tony Montano, the senior manager of art and design for the Auto Club Speedway. We are looking forward to working with each of these professionals in the near future, as well as, many other excellent organizations that we were able to meet and show the quality workmanship provided by Precision Sign and Graphics. Precision Sign and Graphics is a locally owned and operated sign company that utilizes the latest technology, top industry graphic design talent and state-of-the-art equipment and materials to produce our the very best product available in the Riverside, CA. area (or anywhere else for that matter). We seek to build long-term relationships with our customers by treating every customer with respect, understanding the diversity of opinions and a partnering mindset desiring to see your business succeed. Call to let us quote your partial vehicle graphics today! When you start looking for that… wow… factor, you need to look for a company that specializes in it. 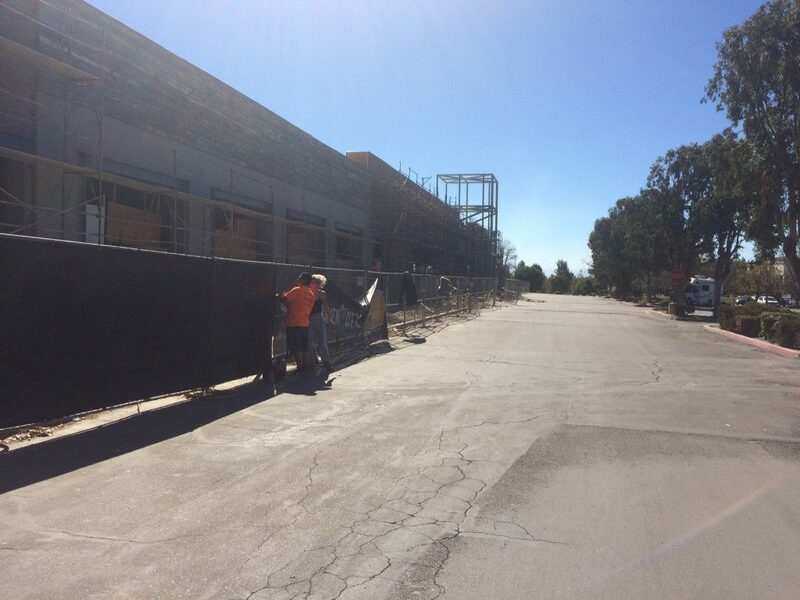 Recently, Eleanor Roosevelt High School in Eastvale, CA. went looking for a company that could keep with their reputation for excellence, and had the capability to “wow” their students and visitors. 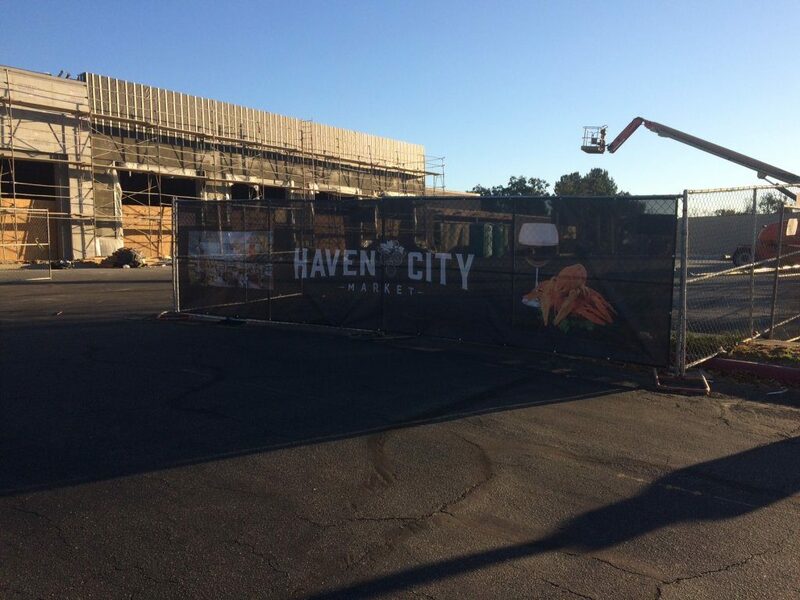 Large format vinyl and cloth banners can be designed, printed and installed by Precision Sign and Graphics serving Riverside, CA. on commercial grade materials making them a durable and long-lasting statement for your school, club or business. 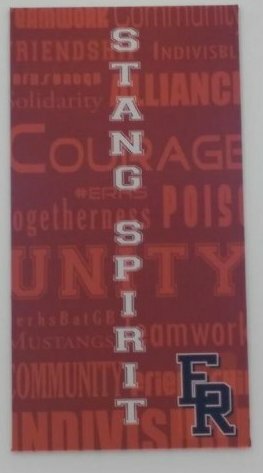 We were so pleased to be able to show our school spirit and print these awesome banners for Eleanor Roosevelt High School. Let’s look at some of the steps that brought about this affordable large-format banner project. P – R – E – C – I – S – I – O – N …. Go Precision! 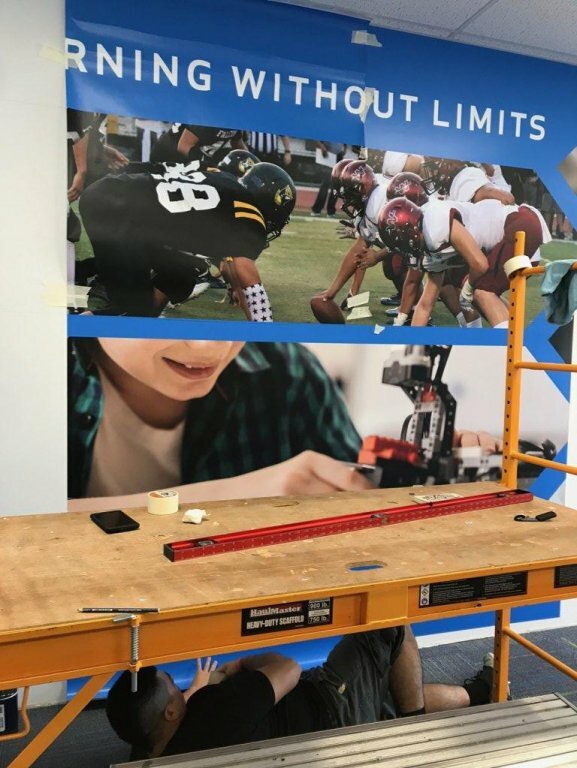 When Eleanor Roosevelt High School in Eastvale, CA was looking for a local sign and print shop that could provide them the large-format vinyl and cloth banners that they needed they considered many factors, cost being one of them. The “spirit moment” was when they chose Precision Signs & Graphics. They looked closely at the craftsmanship and quality of the thick commercial grade vinyl and fabric large-format materials that Precision has come to be known for in the Riverside, CA. area. The perk for Eleanor Roosevelt High School in Eastvale, CA was to be able to find a local company that offered small town prices and quality traditionally reserved for businesses in larger cities or in the national market. They recognize and appreciate the importance of using local companies and vendors whenever possible to help with the Riverside and surrounding area’s economy. 31′ wide x 6′ tall Custom Wall Graphic – Mustang Stampede and saying “BE THE BEST AT GETTING BETTER”. Qty. 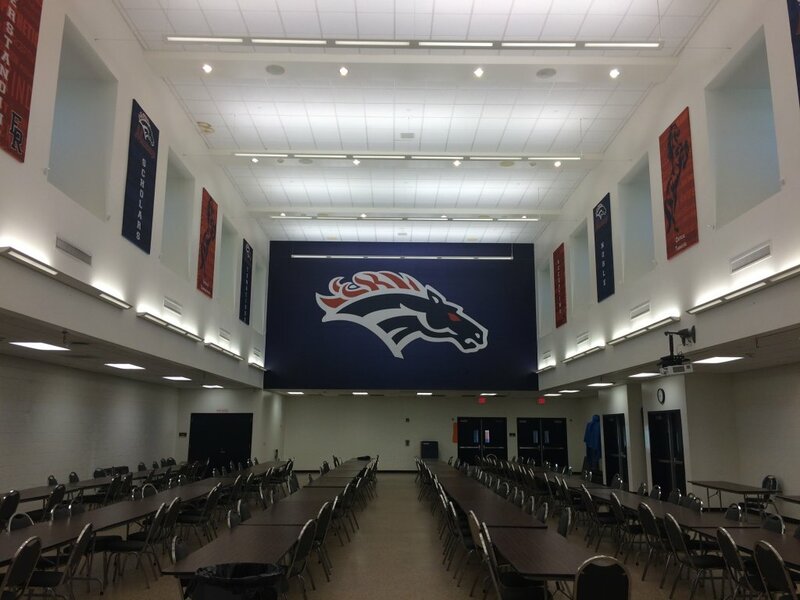 14 – Wall expo cloth banners (to cover existing soundboards) that accent the “Mustangs” Students school goals and spirit. One might think that creating a large-format vinyl and cloth banner design is as easy as finding a picture on Google and just printing it, and for some other sign company out there; that might be exactly how they do it, but not here. When putting together a large-format vinyl and cloth banner design we look at many different factors such as: placement of the large-format vinyl and cloth banner, the lighting in the room, foot traffic (durability), is it just an image or an image with a message. 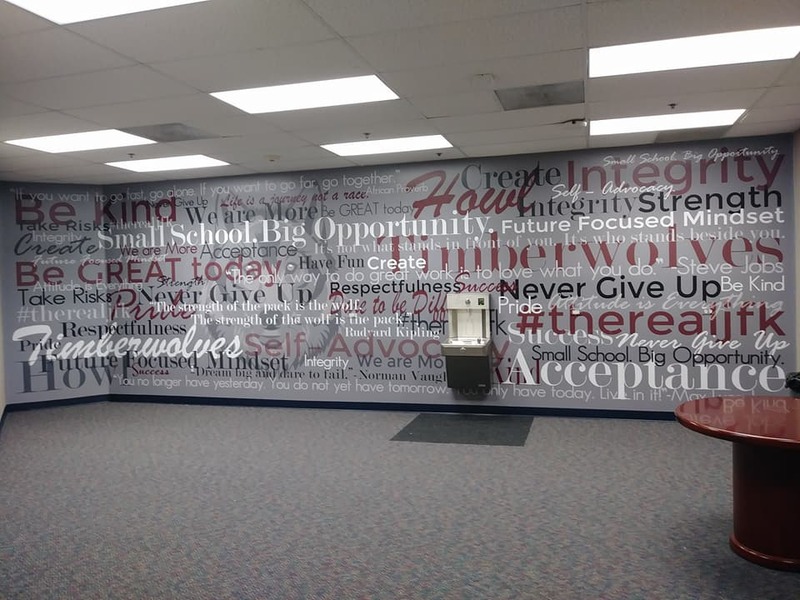 By providing examples to Eleanor Roosevelt High School in Eastvale, CA, we were able to identify the image, graphics and sizing needed to create the large-format vinyl and cloth banners to Eleanor Roosevelt High School in Eastvale, CA ’s specifications. Another consideration for a print job of this size is the use of high resolution, licensed images. You can’t take a small image, downloaded from Google and print it on a wall without it being distorted. PLUS a professional, reputable sign company will always use quality, high resolution images that have been properly licensed for commercial use. Naturally the final large-format vinyl and cloth banner design was approved by Eleanor Roosevelt High School in Eastvale, CA prior to material selection and installation. They were also able to see a full color rendering of what the finished product was to look like before the installation began. 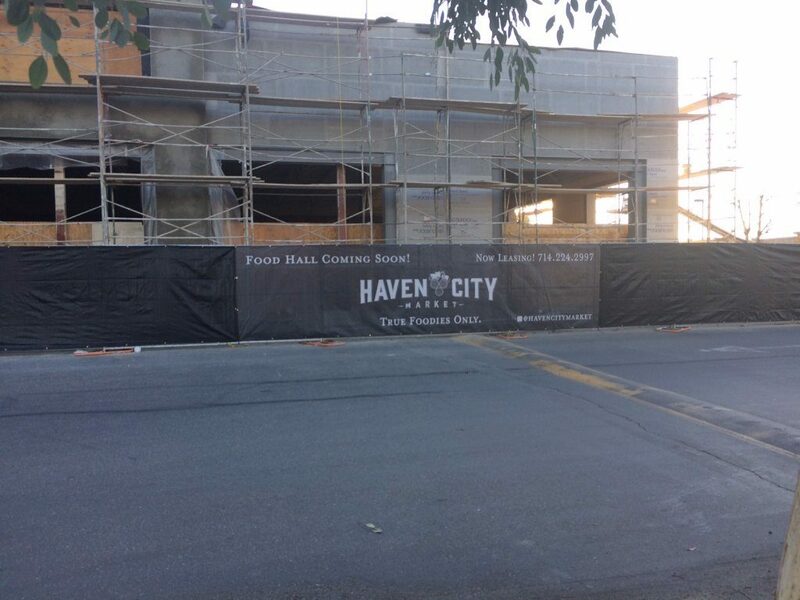 The custom large-format vinyl and cloth banner material used by Precision Sign and Graphics serving Riverside, CA. is made from a thick, commercial grade vinyl and cloth that utilizes cured ink. This helps ensure the durability of the material, even in high-traffic and sunlight conditions. All of the vinyl large-format wall murals were printed with an HP Latex 360 printer onto a 3M Wall Surface Matte Vinyl that comes with a 5 year Warranty. Based upon the overall custom wallpaper design specifications we look for the proper 3M materials that will best suit the application with the desired finish and texture. Materials were carefully hand selected based on the long term mindset we seek to fulfill with our quality custom wallpaper installations. As part of the process for a large-format vinyl and cloth banner installation, the installation crew will receive a design template (printout). Materials are preprinted, cut, labeled (numbered) in the sequence of installation. When dealing with a large area for the large-format vinyl and cloth banner, this is where our installation crew really shines. They take into account that many tall walls have seems, beams, wiring controls and other protrusions that will need to be professionally handled in order for the final product to look perfect. Custom Printed Wallpaper for Purosil LLC in Corona, CA. When looking to set the mood or tone of a room there are a lot of choices: lighting, decorations & music to name a few… but none of those really get that wow factor. Consider walking into a room that immerses you in the environment; this is where Custom Printed Wallpaper comes in. 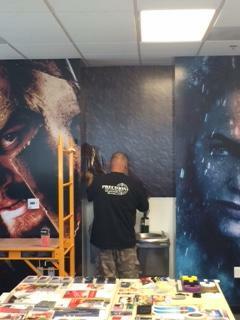 Custom printed wallpaper can be designed, printed and installed by Precision Sign and Graphics serving Riverside, CA. on commercial grade vinyl making a durable and long-lasting statement for your business. Recently Purosil LLC chose to utilize custom printed wallpaper, but not to get the attention of a customer; but rather to provide a bit of respite for their employees. When Purosil LLC was looking for a more peaceful environment for their employee breakroom they considered a variety of things, cost being one of them. 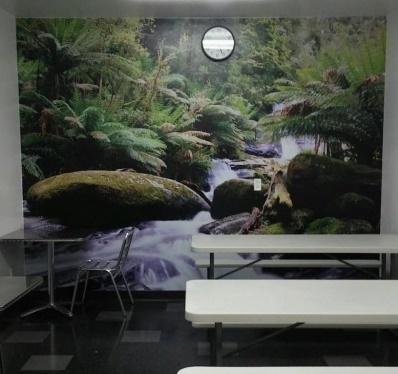 The “ah-ha moment” was choosing to use a large, calming mural scene for the breakroom wall. Next they went looking for a local company to design, create and install their custom printed wallpaper, they chose Precision Signs & Graphics. They looked closely at the craftsmanship and quality of the thick printed wallpaper materials that Precision has come to be known for in the Riverside, CA. area. The perk for Purosil LLC was to be able to find a local company that offered small town prices and quality traditionally reserved for businesses in larger cities or in the national market. They recognize and appreciate the importance of using local companies and vendors whenever possible to help with the Riverside, CA. economy. 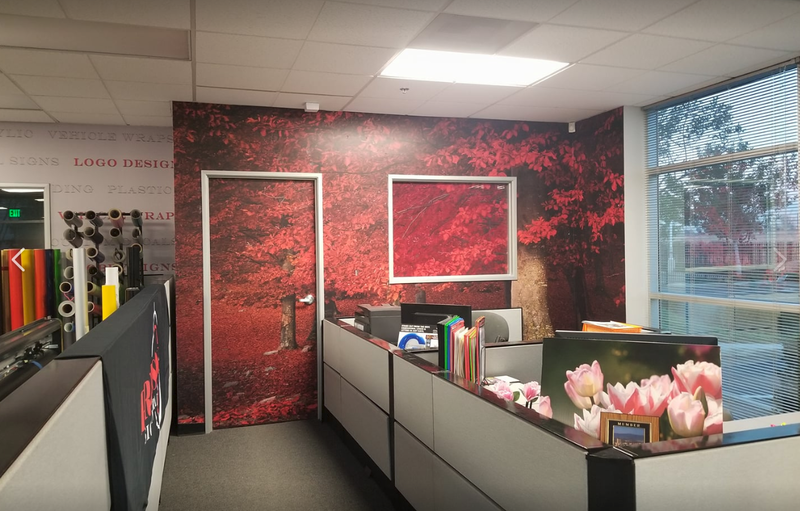 One might think that creating a printed wallpaper design is as easy as finding a picture on Google and just printing it, and for some other sign company in the Riverside, CA. area; that might be exactly how they do it, but not here. When putting together a printed wallpaper design we look at many different factors such as: placement of the mural, the lighting in the room, foot traffic (durability), is it just an image or an image with a message. By providing examples to Purosil LLC, we were able to identify the image, graphics and sizing needed to create the printed wallpaper to Purosil LLC’s specifications. Another consideration for a print job of this size is the use of high resolution, licensed images. You can’t take a small image, downloaded from Google and print it on a wall without it being distorted. PLUS a professional, reputable sign company will always use quality, high resolution images that have been properly licensed for commercial use. Naturally the final printed wallpaper design was approved by Purosil LLC prior to material selection and installation. They were also able to see a full color rendering of what the finished product was to look like before the installation began. The custom printed wallpaper used by Precision Sign and Graphics serving the Riverside, CA. area is made from a thick, commercial grade vinyl that utilizes cured ink. This helps ensure the durability of the material, even in high-traffic and sunlight conditions. There are two main finishes that are utilized when choosing the right custom printed wallpaper: matte and satin. Matte finish: A matte finish to your custom printed wallpaper is best when the mural is not in direct sunlight, but rather illuminated by ambient light sources. Track lighting, can lighting or standard room illumination allows for the colors of the printed wallpaper to be evenly viewed. Satin finish: A satin finish looks best when there is no direct light. A satin finish can produce the “shimmer effect” because of the glossier finish. When a satin finished custom printed wallpaper is properly placed it adds a stunning visual effect and really makes the colors of the mural pop. With each of these two options you can also choose some light texturing. Standard printed wallpaper covering is traditionally smooth to the touch. Combined with the durability of the vinyl this finish is easy to clean and is perfect for bisinesses in the Riverside, CA. area with high-traffic areas where it’s being constantly touched. For a more elegant look and feel, a canvas texture can be used to make your printed wallpaper appear like a painted work of art. Based upon the overall custom wallpaper design specifications we look for the proper 3M or Avery materials that will best suit the application with the desired finish and texture. Materials were carefully hand selected based on the long term mindset we seek to fulfill with our quality custom wallpaper installations. As part of the process for a Custom Printed Wallpaper installation, the installation crew will receive a design template (printout). Materials are preprinted on our HP3 Latex 360 large-format printer, cut, labeled (numbered) in the sequence of installation. 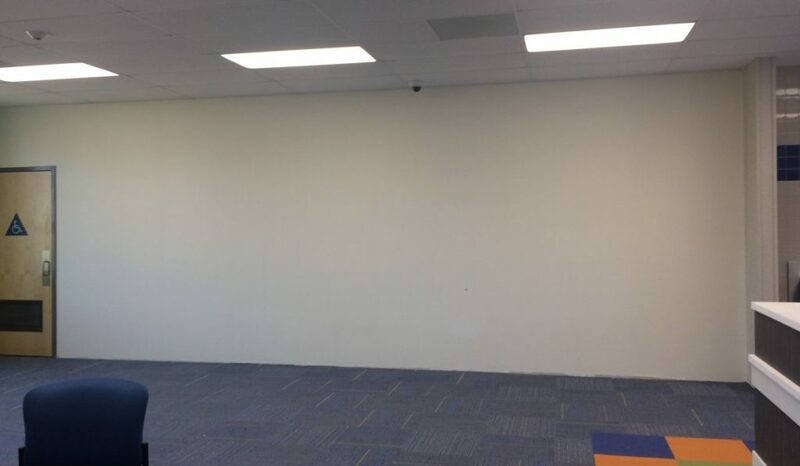 When dealing with a large area for the printed wallpaper for businesses in the Riverside, CA. area, this is where our installation crew really shines. Many walls have seams, doors, thermostat controls, light switches and other protrusions that will need to be professionally handled in order for the final product to look perfect. Precision Sign and Graphics is a locally owned and operated sign company that utilizes the latest technology, top industry graphic design talent and state-of-the-art equipment and materials to produce our the very best product available in the Riverside, CA. area (or anywhere else for that matter). We seek to build long-term relationships with our customers by treating every customer with respect, understanding the diversity of opinions and a partnering mindset desiring to see your business succeed. Call to let us quote your custom printed wallpaper today!